This is a round up of all bloggers who participated in the cauliflower challenge. Click on their names to be taken to the blog post. A big thank you for all the support. I am a huge fan of cauliflower but it has become so fashionable to eat and therefore quite expensive. As there are only two of us I kind of ignore the cost but I am not sure how the average family is dealing with this. Do you look at the price of seasonal vegetables? Gaby posted a wonderful memory and recipe of Moroccan flavours. Leaine made fish balls with a cauliflower purée. Carey has three lovely recipes for you to chose from. 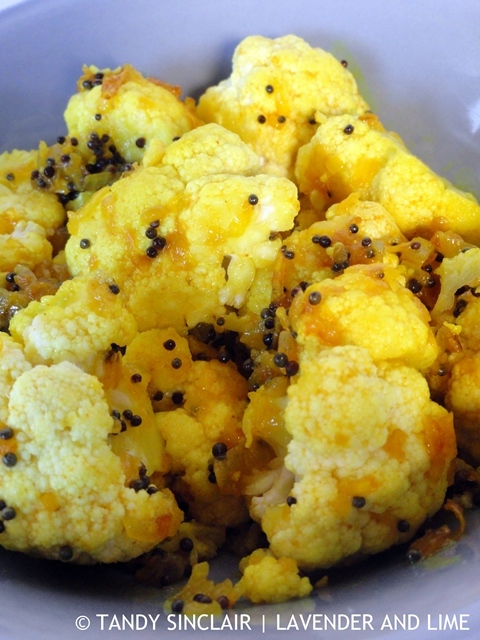 Zabwan has a fantastic roasted cauliflower recipe for you. Cindy satisfied her curiosity about pork belly and made a rosti to go with it. Late ‘entries’ to last weeks challenge came from Fired-up Cooking and will give you an idea with what to do with left over chicken. Shaz also used chicken for her pasta – but her was smoked. Cindy is doing Tandy Tuesday and this week made a salmon pasta. PinkPolkaDot is making the most of her paprika gift. Is it just me or are you getting more ‘participants’ for the challenges?? thats great! I am not getting as many participants as I would like, but I am not phased! Looking forward to your recipe – and why on earth did you get home so late?